If you never looked at a calendar you would know it was September. The powerful cold front that swept through the area that brought the days of hard north wind is the first sign of the season. Like every Sept, you can set your clock to it. In fact, the Sept cold fronts are the driving force on the timing of all my tours, trying to get back before I have to paddle into days of northerly headwinds. I got out twice this week. First in the backwaters during the blow. The water was muddy but I found and jumped some 'pore mans tarpon'. Ladyfish are kinda rare for these waters but every once in a while I run across these acrobatic little fish. The second day I headed for the Shore hoping to get into some clearer water. I arrived on the drum grounds and stood up. I could see the bottom in three feet water. Not the greatest but good enough. I had an onshore wind at 10mph which put some visibility decreasing chop on the water. The one foot rollers gave me just enough flat water surface on the face of the wave to see through to some fish at a distance. I would try to stalk them but they would lose me behind the waves. I had many shots, a couple follow, few pull off's and two in the boat. a 29" and 33 incher. I updated the Links Page. I included the sites I use to help me decide where and when I fish. I hope they are helpful to you. I also finally got a super cool logo from Alan Tharrington fishdv8.com he does the graphics for the pirates of lynnhaven and kayak bass fishing websites. Alan dose awesome work. I headed for some sight reds action the next day, hoping for some clear water. The clarity was not good enough to see anything at a distance, not like last year when we could see them out 20 yards. I could only see them out 15 feet, and the two 33 inchers that I landed were heading right at me. I was standing above two feet of water with the clarity about the same. This was the only area that I could see the bottom, and the reds. The first one appeared head-on to me. I squatted to put my paddle down and first reached for my camera. In that split second I decided it was too late to shoot and reached for my rod. The red saw me, I froze as he pumped once with his tail and cut left with his back to me. I stood up and lobed my 2oz spro jig with a big curly tail gulp five feet to the right of the red. As soon as it splashed down he turned and had it in his mouth before I had my reel in gear. As I was getting shots of the fish drumming in the water I heard another one drumming beside me. I moved and a big mud boil billowed beside me. Later in the day I was hunting again. I ran into another red the same way as before. I squatted and froze and the red made a U-turn. I stood and cast five feet to its right. He immediately jumped on it as if it was a mullet that landed to close. This one burned off line in the two foot water before I could get my kayaks momentum going behind him. Rock fishes between the weather. It was another sketchy weather week, the winds have been bad, the rain has made the visibility very low, and the new moon this week has the current ripping like a Georgia tide. We had to fish a few different places to escape the conditions. We managed to find a few fish wherever we fished. 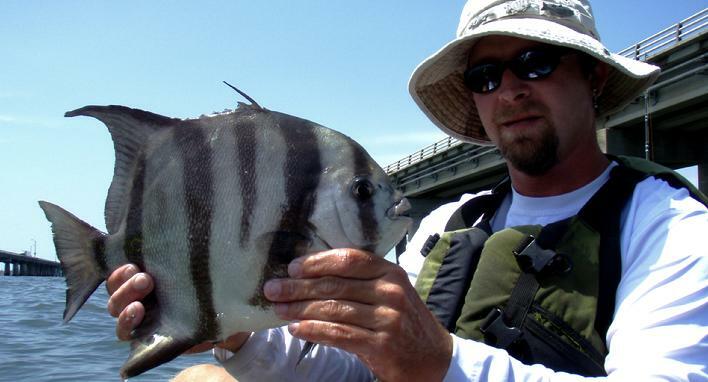 Lee had the 'rock slam' with a triggerfish, tautog and sheepshead. I headed out to find the 'island slam', spade, trigger, tog, and sheep, but came up short when I had to paddle into the afternoon storms. My plan was to hit the bridge at the morning slack current for sheepies. I got there at the right time and dropped a fiddler to the bottom. There was a slight extra tension on the line and my fiddler was gone. I knew exactly what that was and set up my stern camera, it wouldn�t be long to hook my target. The next drop a little tap removed my bait. On my third fiddler it slightly moved and I set the hook only to have it ricochet off the mouth full of molars. The next drop I felt it get a little heaver and I drove the hook in solidly. I had my drag locked down and my rod was bent into the water. It�s a tougher fight but it kept him from getting on the pilling. The 24 inch sheep hit the surface with a violent splash. The current picked up with the wind. I couldn�t sheep fish anymore but I was able to land a few spades before I retreated to the island to escape from the wind. The water was murky so I took a nap. I woke up to the darkening southern stormy skies and headed on in. I hit the storm a mile from shore and paddled under the bridge the rest of the way. The only other small window Lee and I got was between storms so we stayed inland on the southside. The water clarity was dark but we caught a few small usual stuff. Then we were paddling along a stretch of sand and I saw a little red pushing up on the sand. I pitched my jig to the sand and pulled it into the water and instantly hooked up to a 20 inch red. Sometimes you don�t need to go to the e-shore to sight cast reds. 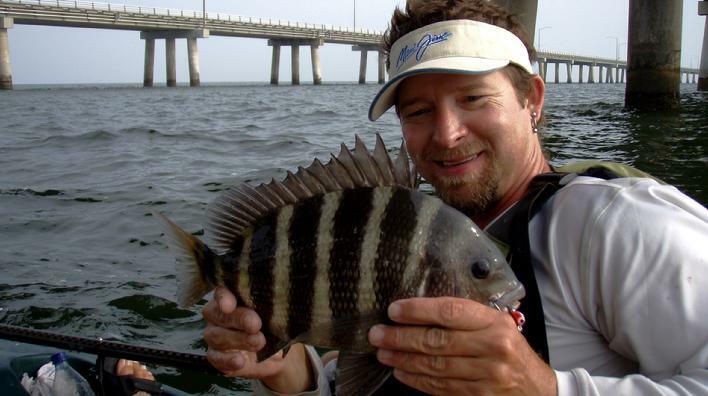 I officially announced the �Kayak Fishing the Chesapeake Bay� DVD with the trailer posted on my home page and YouTube. The trailer stars, in order of appearance: Damien, Mike P, me and Lee. It has footage we have shot so far, shoal reds, sheepshead, spadefish, triggerfish, and that giant turtle I hooked while cobia fishing. 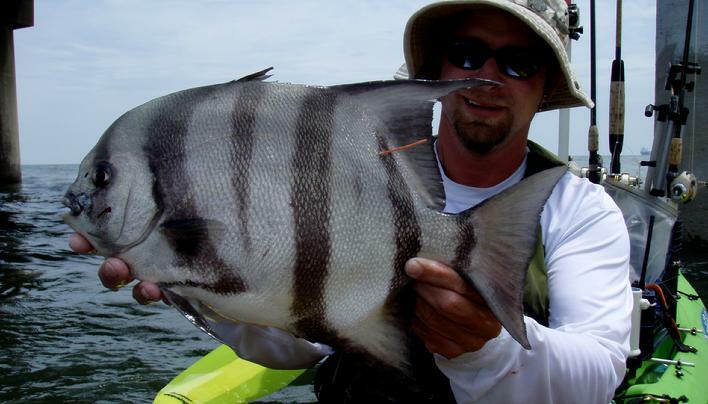 We still hope to film the fall run reds, tautog and the kipto stripers. What's that old saying, when life gives you lemons, make lemonade? Well, when we paddle out to the bridge on the assumption that the NOAA wind forecast could be anything but a lemon, we can always find lemonade in the lee side of the island. After Damien and I were blown off of the pilings, we found a small black drum each and some aggressive triggerfish on the side of the island. I was drawing the triggers up from the rocks, to the surface with clam as Damien got some amazing underwater shots for the "Kayak Fishing the Chesapeake Bay" DVD. Lee and I had to decide between cobia and reds. The storms were going to happen in the afternoon so we decided to stay inshore, just incase. The water was clear enough to see thousands of crab scatter like roaches, but the overcast sky only allowed us to sight reds when we had already run them over. The ones we did get a shot at were in schools that we could see further out. I found one school and filmed the whole fight as Lee pulled a 34" red out of the mix of red and small black drum. Later, I ran head-on into the same school and pulled a hard fighting 24" black drum. The next day I went back after the heavy rains to find the sun out, but the water had muddied up to a two foot visibility. We are still chasing the days we had last year of 23 to 30 sight-caught high 20" reds. This years rain and wind is the complete opposite of last years stillness and heat. I can�t get enough of these little fish. I should be spending more time targeting the big sheeps but it�s so hard when you have to drop through a hundred small spades that are snapping, for one big fish. Especially when one of the larger spades fight as hard as a near citation sheep. 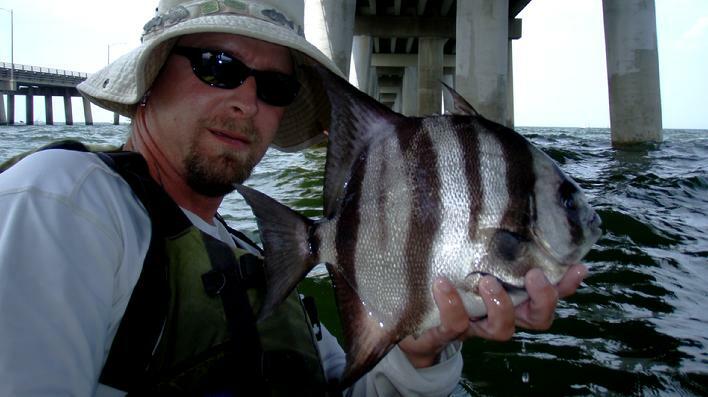 My buddy Rob from work landed his first kayak spadefish. I tagged and measured it at 13�, Rob�s reaction was, �That thing is only 13 inches?� spades are amazingly strong for they�re size. A 13 incher is fun but the real fights are the 15 inchers and up. And there are plenty of those. When I come across a cool website, I like to let ya�ll know about it, especially when it showcases our east coast wildlife and an incredible talent behind a camera. Jay Fleming (jayflemingphotography.com) has outstanding shots of the Delmarva estuaries and beyond. Be sure to check out the shark shots at the bottom of the "June 2009" page. Damien and I got lucky with a light incoming current so we were able to hover on the pilings and land spadefish up to 16". I got even luckier and put a piece of clam in front of a big sheepshead. Its been so long since I've fought one I forgot how hectic of a fight they give ya. I was also lucky that he ran away from the pilings. One sure thing about sheepshead is the way they hit. Each one will hit the bait differently, but they will all hit it weird. Some will thump it, some will move away with it, some will lift up on it, others you wont even know they are there until you check the weight and there is something extra on your line. Something fun for the family and a great cause is the 14th annual Hampton Roads Regatta benefiting the St Jude Children's Research Hospital. Activities include the Little Creek Regatta, Catamaran Regatta, Flounder Tournament, 5mile Kayak Rally and the All you can eat low country boil all American picnic. Check out the info at hamptonroadsregatta.com. Damien and I headed to the red sight casting flats hoping for some clear water. The water was churned up from many days of wind. The combination of two foot visibility and the wind ripples on the water made it tough to sight any from a distance, and we didn't see many. The few we did see we couldn't get a shot, the wind would push us over them scaring them off. Out of the half dozen we saw Damien caught a 26 incher and I caught a 21 and a 30 incher. While I was stand fighting the 30, I saw one that looked about 34". The one I landed had a North Carolina tag. I'll put the tag info up when I receive it. A few days later I went back to that same spot. The water was so muddy I couldn't see the tip of my paddle during the strokes. I was blind casting into some deeper holes when I saw two large boils, then my line snapped tight. I could swear this 33 incher was the same one I saw days before. Damien and I paddled out to the CBBT on a day the wind was forcasted to be calm in the morning but come out of the south at 15 mph in the afternoon. We knew we would have a calm morning and the usual two to three hour head wind paddle back in the afternoon. This has been the norm this year and we are unfortunately, just getting use to it. 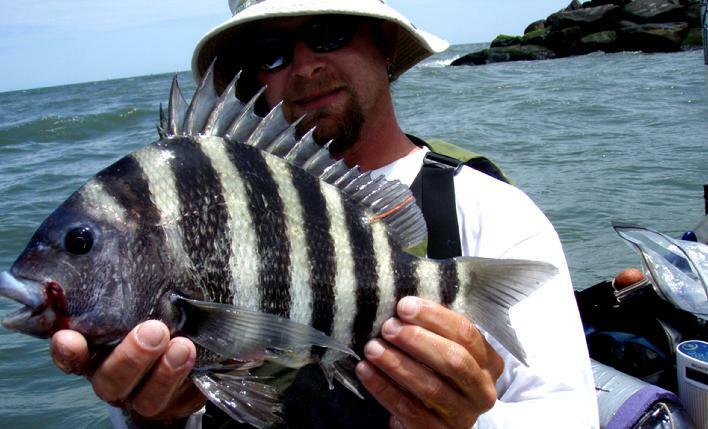 We caught 10 to 13 inch spadefish with two small sheepies thrown in the mix. When the combination of the wind and current made it impossible to hover on the pilings, we headed in. The western sky looked kinda dark through the haze. We checked the weather radio to hear about the line of thunderstorms capable of gust up 70mph, hail and continuous cloud to ground lighting. Our usual steady pace in the head wind quickly became a mad dash for safety as the storm was approaching Suffolk moving at 40mph. We made to the landing in an hour in a 15mph southeast wind and an easterly ripping incoming current. There is nothing like a life threatening storm bearing down on ya for some motivation. The wind was still the enemy this week with a steady northerly blow. The window opened for one morning but was going to shut in the afternoon, we jumped on out to the CBBT with spades the primary target. 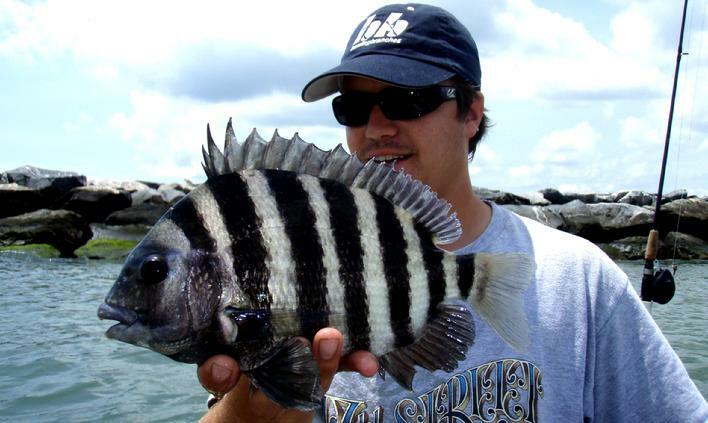 I spend a little time looking for sheepshead as the current ran with no bites. Once we could hover around the pilings we began to catch some spades. We caught allot of 9 to 10 inchers with a few hard fighting 14 and 15 inchers in the mix. A 15 inch sheep fights harder than any other fish of the same size, well worth the paddle out and the miserable two hour head wind paddle back. Windy spadefishing and one big one. The wind forecast changed hourly this week, giving the illusion of a window of opportunity to fish the open water around the CBBT. Damien and I were able to fish in calm conditions for about an hour before the winds jumped from NW at 5 to east at 15, with a incoming (easterly) current. We were already there and catching baby spades as it got pretty sporty out there, but we were procrastinating paddling back. We've had to do it before in the same conditions and it took three hours, so we knew what we were getting into. When we finally decided to head back we paddled piling to piling, hiding from the wind and eddy to eddy hiding from the current. Of course the wind dropped out when we landed. I battled the holiday traffic and beach crowds to launch into the wind. The forecast called for the winds to drop out, but it didn't, and it was a tough day. I paddled my Prowler 15 instead of my Drifter for the ease on the way out, but it was incredibly difficult to maneuver around the pillings in the wind and current. I found the spades again and was steadily catching 8 to 10 inchers. I could see larger ones swimming up with the hooked ones. Then I hooked into a real fighter. I was sure it was a sheepshead like Damien did last year while spade fishing. During the fight, it ran fast up current and around the piling. I put my reel in freespool and quickly paddled forward to work it out. When the fish came in visual range it was a big spade. I was surprised to land one that size when the average was 9". I thought I saw larger ones down there. A little bit later i hooked into another big one that ran down and around the piling before i could follow it thru and broke off.